From the moment you descend the steps into The Running Works, you can tell this is a running store like no other. 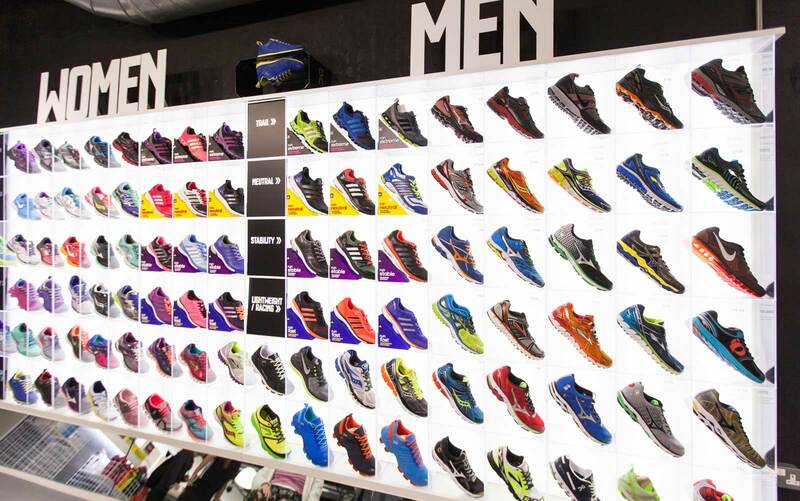 From the innovative shoe wall to the clean modern design and carefully chosen kit and shoe selections we are equipped to meet all of your running needs, whether you’re a beginner or seasoned club runner. The Running Works team is staffed by enthusiastic, experienced runners who have raced every distance from 1 mile to ultramarathon. Our team offers free gait analysis to help analyse your biomechanics, which in turn assists us in recommending your running shoes, selected to meet your own specific requirements. The store is our community hub where we host running specific special events, product launches and our weekly run club sessions. Everyone at The Running Works is passionate about running and we want to share our love of the sport with anyone who’ll listen (which is hopefully why you’re here!). There are lots of running shops in London and we know that, as an independent store, we need to stand out from the crowd. As well as stocking specialist running shoes and clothing, we have our very own in-store coffee shop. The Secret Frog Coffee Co. serves lovingly brewed Monmouth Coffee, a local roaster based just down the road near Tower Bridge. Serving breakfasts, lunches and hot and cold drinks, The Frog is the place to refuel and relax after a run. Not forgetting such treats as delicious cakes and locally brewed beers. The Running Works is fortunate to be equipped with a spacious treatment suite where our skilled clinicians offer a range of services, including physiotherapy, sports massage and even bike fitting. The Run-Fast Sports Clinic team have years’ of combined experience supporting runners to recover from injury, stay injury-free and optimise their performance. All members of the Sports Clinic team are keen runners so understand the frustration of injury, and the importance of returning to the sport as quickly as possible and with confidence. The Running Works is also home to Run-Fast Sports Management. Run-Fast is proud to support and develop a team of international elite athletes, hailing from the United Kingdom, Kenya, U.S.A, Uganda and Ethiopia. The Run-Fast Sports Management Team has a permanent high-altitude training camp in Iten, Kenya, and a secondary facility in central London where the Run-Fast athletes live and train whilst racing around Europe.